I am one of the newest members of the White2Tea monthly tea club. My first month was July which I'll likely post about later, but today I had two of the three teas featured in the August package which highlighted some Wuyi oolongs. 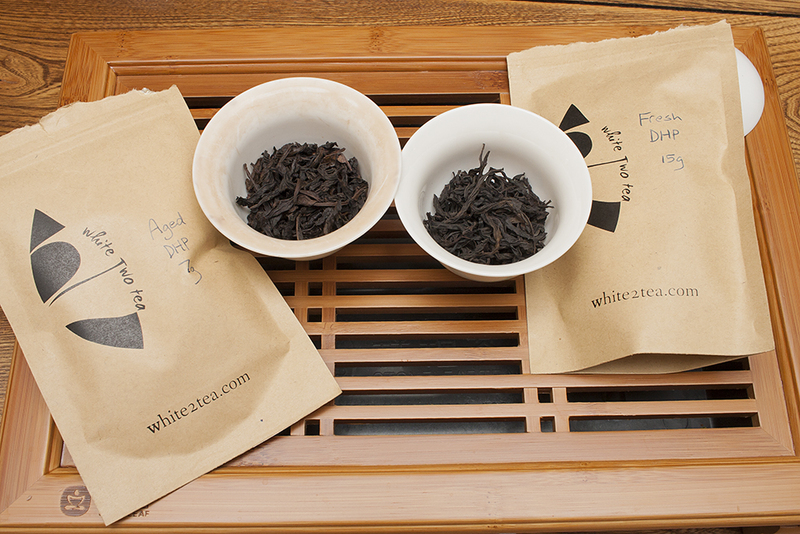 Although White2Tea's primary focus is in puerh, they do have some select Chinese black teas and oolongs. The tea club package for August hints that they are in the process of adding new oolongs to the selection, one of which will be an aged Da Hong Pao. To give some perspective on what some age can do to a Dahongpao, the package included a sample of freshly roasted Dahongpao for comparison to the aged DHP. So it made sense for me to drink them on the same day. These teas are reportedly made by the same farmer on the same land, but the aged one is about 8 years old. At first glance there are not too many visual differences, though the aged one may be slightly more brown. The aroma though does reveal more roast scent in the fresh version where as the aged one has a bit of leather smell instead. Both teas have a dominant chocolate smell in the dry leaf. Both teas brew a nice clear reddish brown liquor with similar looking wet leaves, but the similarities stop there. The brewed fresh DHP smells of fresh cherries and strawberries and is very candy-like. The gaiwan lid actually smells exactly like cotton candy. The brewed aged DHP has a darker aroma of black cherries and raisin with a hint of fig. The mouthfeel of the fresh DHP is very thick but otherwise not very active, while the aged DHP has a very soft body and a mouthfeel that is active with pleasant astringency and tartness on the back and sides of the tongue. The enclosed description newsletter with this month's teas mentioned that the fresh DPH will have "thrashing youth" and "harsh and sharp" roast flavor compared to the aged one which should be "mellow" because the "fire flavors have subsided." After tasting these teas I can easily agree that the aged DHP is much more mellow than the fresh. The fresh version is initially very sweet and fruity, though almost unnaturally so-- like strawberry candy as opposed to real strawberries. The roast flavor does seem harsh and almost gives the tea a plastic taste, but the fruit flavors keep it enjoyable. The aged one still has a dominant presence of fruit in the initial brew, but the fruits seem more natural and darker, like black plums, black cherry, and autumn apples. The aged DHP is definitely very mellow compared to the Fresh and has a hint of that "dry leather" taste that I find in some aged teas. With the roast flavor being less prominent, the aged tea takes on an obvious mineral/earthy clay flavor under the fruit notes. The aftertaste of both teas is pleasant and follows the main taste. The fresh DHP has a lingering strawberry jam aftertaste and the aged one has a nice apple cider aftertaste with an apple peel flavor in the back of the throat-- I'm not sure what it is about apple peel aftertastes, but all my favorite roasted oolongs have this. Both teas have a floral component to the aftertaste which begins to show up after a few infusions. As the teas evolve over further infusions the aged one seems to remind me more and more of a slightly aged sheng puerh as some orange peel and coriander flavors start to come through. Much to my surprise the fresh one began to transform with very strong and dominating presence of guava! It still remained candy-like though, and had nearly an identical taste as a guava candy that I am very familiar with. My favorite Chinese restaurant has a large bowl of them on the checkout counter, and I used to sneak extras into my takeout bag until very recently when I found out that I can buy them in bulk at my local Asian supermarket. These would be a great way to extend the aftertaste of this tea if you wish. Overall it is almost difficult for me to say which of these teas I liked better. As of right now the Fresh Dahongpao is not a tea that White2Tea is planning to have for sale (at least in its young state) and was simply included as a comparison tea for the aged version. The club newsletter actually mentioned that it would "likely not be a crowd favorite, though some may love it." I do agree that the "freshness" of this recently roasted tea does come across as "harsh" and "sharp" and the flavors seem almost unnatural, but the flavors are definitely interesting and the tea seems a bit unlike other teas I have had which makes it something I would enjoy drinking from time to time. I drank it today on a mild summer day which was nice, where as the aged DHP would be cozy on a cool autumn day. The apple peel taste of the aged tea is a key flavor I love in roasted oolongs and easily makes this one I would consider buying more of. As of right now I do not know the price since the website has not been updated yet and that would be an important deciding factor. I also think that the aged one would do better with even more leaf. I had my gaiwan about 1/3 full but would definitely like to try this tea again with at least 1/2 full. The third Wuyi tea included in this month's package is called "Clover Patch Oolong," which is reportedly very different from the DHP despite coming from the same farmer. I will brew that one soon! 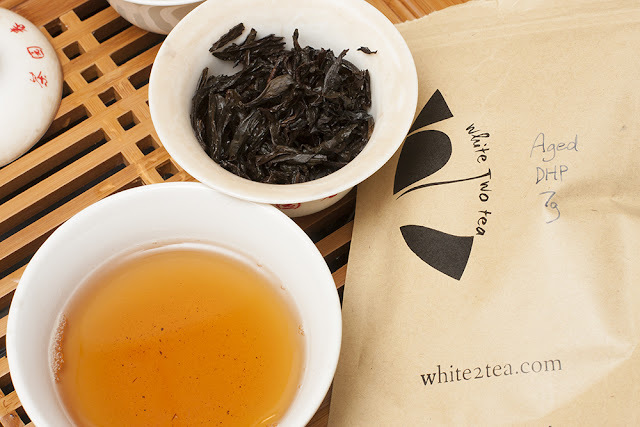 Keep an eye on the White2Tea oolong page where we'll hopefully see some new teas added soon. I still need to try more of the ones that are already there as I've only had the OBSX so far, and it's REALLY good.